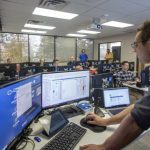 QSC has opened a new training center in Boulder, Colo., where the hands-on learning environment complements extensive and unique comedy-infused online training offerings. 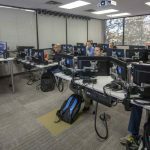 QSC has opened a new training center in Boulder, Colo.
There’s a lot of training available to AV professionals so it takes some effort to stand out with a unique AV training offering. 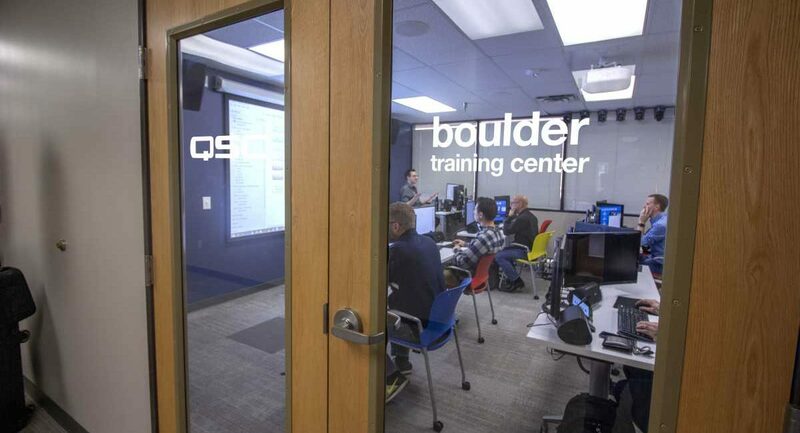 The news of QSC’s new training center in Boulder, Colo., which offers a hands-on learning environment to deliver QSC ecosystem training to integrators, programmers, consultants and end users is significant – but it’s only part of QSC’s unique training strategy. Consider that Nathan Makaryk, QSC’s senior training manager, and Patrick Heyn, director of marketing – the personalities featured in many of the AV training videos in QSC’s online library – leverage a comedy background. “Nate and I went to college together. We’ve done improv comedy now for almost 20 years together, so we have a good sense of what is enjoyable to watch,” Heyn tells Commercial Integrator. Back in September QSC announced its Q-SYS Control Training series. Building on the Q-SYS Training Level 1 & 2, this new series includes Q-SYS Control 101, which is an online introductory course with 20 new videos that help lay the foundation for programming, and Q-SYS Control 201 classroom training, which applies this foundation onto common third-party meeting room devices and control scenarios. Q-SYS Control 101 is ideal for those integrators looking for their first exposure to control programming training, or for those programming experts who want to apply their existing knowledge specifically to the Q-SYS Platform. The online course covers Q-SYS plugins, custom control components, the new Block Controller visual coding tool, and a basic introduction to modern Lua scripting. The videos employ the same style of insightful, succinct, and biting humor that have become the bedrock for QSC Training. Available now, Q-SYS Control 101 takes approximately 4-5 hours to complete and offers 2.5 AVIXA CTS renewal units (RUs) at its conclusion. Q-SYS Control 201 is a one-day classroom-training course that incorporate dedicated Q-SYS workstations and common third-party devices allowing students to apply the learning from Control 101 to real-world applications and scenarios. QSC has trained its global application engineering team and select distributors to administer the curriculum in an effort to help more integrators and programmers experience the robust power of software-based control. Q-SYS Control 201 classes begin this month, offering 4.0 AVIXA CTS RUs after successful completion. “This new training curriculum represents a major milestone for Q-SYS by pairing a simplified control paradigm with an equally simplified way of learning control,” adds Heyn in the press release. “Our AV training takes full advantage of the modern scripting languages and innovative tools available in Q-SYS Designer Software to teach fundamental programming principles in a matter of days rather than weeks and months. Obviously, Heyn and Makaryk use creativity to hook and engage QSC training participants. CI asked Heyn about their process for creating rich, valuable content that weaves in comedy elements. So far the creative elements of QSC’s training have been well received by participants as well as internally at the company. When Makaryk and Heyn began weaving comedic elements into the AV training they were concerned that “people were going to hate the wackiness, people seemed to love it,” Heyn says. As for QSC trainees, there has been positive feedback. “We get emails. I have a folder in my Outlook just so I can keep the nice letters that we get from our students,” Heyn says. The comedy, Heyn hopes, serves to help QSC extend its powerful messages. The newly opened Boulder Training Center currently offers courses focused on the Q-SYS Platform, including Q-SYS Level 2 and Q-SYS Control 201. The facility’s flexible design allows for future training sessions across other QSC products to be rolled out later next year, according to a press release. Each student works on a full Q-SYS workstation, including the latest Q-SYS Core processors and peripherals, along with common third-party devices, allowing students to develop real-world AV&C systems. All QSC online and classroom training is offered to students free-of-charge. The training center will also be used as one of many virtual AV training hubs for “Train-the-Trainer” programs. Partners will learn to deliver standardized QSC curriculum in an effort to ensure all customers receive the same learning experience worldwide. … “Training is one of the most effective ways QSC connects with its customers. We have worked hard to create best-in-class training opportunities that are interactive, fun and accessible,” says Patrick Heyn, Director of Marketing,QSC Systems. Part of the strategy is that when AV professionals make their way to Boulder for training, they benefit from those on-site engineers. “We’re taking full advantage of them in these classes,” Heyn says. “Rather than getting trained by a well-qualified application engineer — and there’s nothing wrong with that — if you travel to Boulder you’re actually going to get taught by product managers, technical directors and our own programmers.